Company is nice—I’ve always said I cook to share and I love sharing new dining experiences with friends and loved ones—but there’s something beautiful about eating alone at a regular hour every week, free from distractions. Every bite is magnified; every taste comes alive. I can appreciate the full creaminess, the subtle sourness, and the fatty richness of a bowl of barely adorned, high-quality Greek yogurt in my own company much more than I can with others. Every move is felt: dip of spoon, scoop of dairy, movement to mouth. When done, I feel more satisfied, more conscious of my eating, and more thankful for what I have before me and what went into it, even if it was just yogurt. It’s when I’m eating alone that most ideas come to me. Inspired even by the plain yogurt in front of me, I can discover what it is I desire to do or make over the weekend. Something simple and even boring in that time can strike me as beautiful, as necessary. A private lunch followed by a solitary dinner does not depress me, and I’m thankful for those meals, happy to share the time with my mind, my plate, and the wildlife that made it possible. This Saturday, my heart said not to fiddle. My solitary moments dictated my weekend. I felt the need to comfort myself with what I cooked, making things for me and me alone. Early Saturday morning, my tongue tasted persimmon (although I had not one persimmon in my kitchen) in addition to the raisins and banana it was physically in contact with. And once I tasted it, I needed it. I needed its sweet, almost-to-be-shelved-till-November flavor, and it’s soft but appealing innards. The tongue triggered the eyes, which needed to be awakened from the glum and piqued by fiery color. So persimmons were bought. That would be my project. Eating through the persimmons. Raw. Unembellished. I have no recipe today. I didn’t write one; I didn’t read an already-published one. I bought too many persimmons. 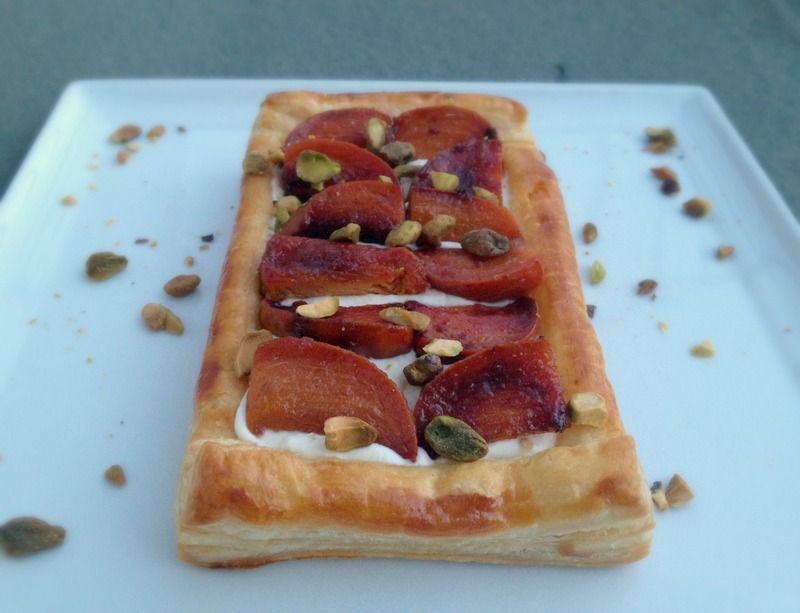 So I took what I had — leftover homemade puff pastry that I had defrosted for another project I never got to; crème fraîche, a little of which was used for a dinner of salmon; extra pistachios that I had toasted for breakfast; a knob of ginger I had never finished; and of course more persimmons, since my eyes were bigger than my stomach — and made myself dessert for one. OK, so I split this between two servings. But it was just for me at my table, no one else. Should you want to enjoy a tart like this for yourself and taste persimmon one last time before it’s gone you can do the following: Roast cut persimmon in honey and sugar with slivers of fresh ginger until well caramelized, tossing once or twice during cooking. Make a rectangle of puff pastry of your desired size, placing ¾-inch-ish strips of dough on all 4 sides and prick the middle. Freeze before baking. Bake until puffed and golden brown. Whip some crème fraîche and spread it in the center of the tart. 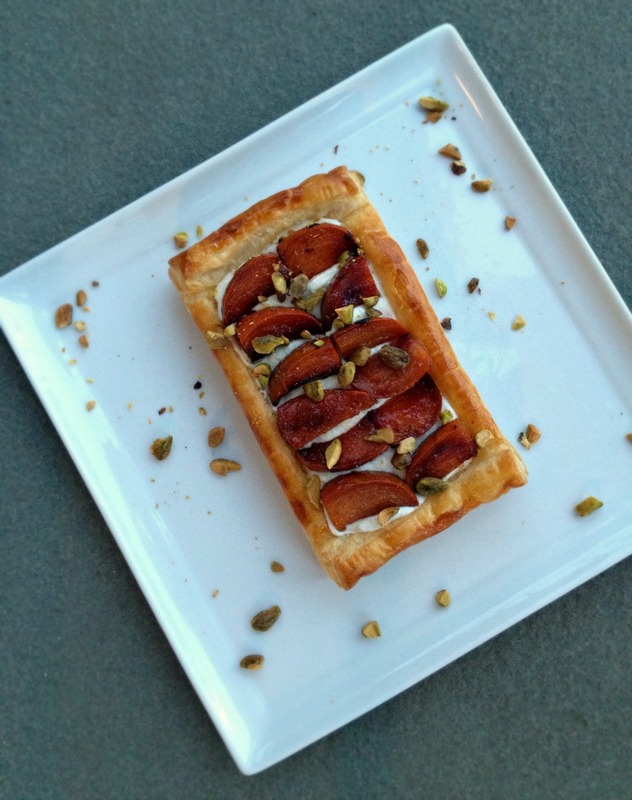 Arrange syrupy, delicious roasted persimmon, cut to your liking, on top and sprinkle with roasted pistachios. You don’t always need a recipe to make something beautiful. Have fun. Living with my boyfriend I hardly ever eat a meal alone. I adore cooking for others and I think it inspires me to be more creative. Having said that, there is something wonderful about the odd stolen meal for one, cooking exactly what you love and adding ingredients that only you might like. This looks gorgeous – the perfect combination of flaky, sharp, sweet and crunchy. I’ve never done anything with persimmons, but you’re making me want to. This tart sounds so amazing. And I love how it just came together. well said. beautiful writing, as always.